Because despite its strengths, R has a number of drawbacks and, er, eccentricities. Most of these drawbacks can be traced to the fact that R was created 20 years ago as an open-source implementation of a previous language, S, which was created twenty years before that. The package ecosystem on CRAN is huge, but there is a lot of confusion and overlap: it’s not uncommon to find three packages that each do 2/3 of what you need. And if you’re writing your own code for something not available in a package, R can be very slow. If it can’t be vectorized–that is, if you need to write it in a loop–your choices are to leave R and write that bit in C, or hit “Enter” and go get a coffee. They stop short of demanding a pony, but you get the idea. What kind of language could possibly come close to doing all this? Well, as it turns out, the one they created. Julia is a really well-thought-out language. While the syntax looks superficially Matlabby, that is about as far as the similarity goes. Like Matlab, R, and Python, Julia is interactive and dynamically typed, making it easy to get started programming. But Julia differs from those languages in a few major ways. Under the hood, it has a rigorous but infinitely flexible type system, and calls functions based on “multiple dispatch”: different code is automatically chosen based on the types of the all arguments supplied to a function. When these features are combined with the built-in just-in-time (JIT) compiler, they let code–even scalar for-loops, which are famous performance killers in R–run as fast as C or Fortran. But the real killer is that you can do this with code as concise and expressive as Python. 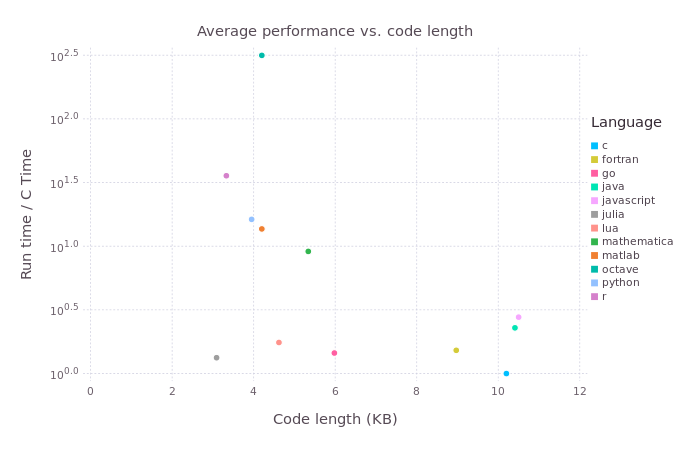 This graph shows average run times of several small benchmark programs, plotted vs. the average length of their source files. The times are relative to C. Note the log scale on the y-axis. Ideally, we want concise programs with short run times–i.e., lower is better on both axes. The graph shows the classic tradeoff in technical computing. Compiled languages like C and Fortran (lower right) are fast to run but slow to write, while “scripting” languages like R and Python (upper left) are fast to write but slow to execute. But wait, what’s that grey dot way in the lower left-hand corner? Libraries. Julia has a centralized package registry and built-in package manager, and while not anywhere near as big as CRAN, it already covers many of the day-to-day tasks a data analyst might want to do. You can read in tabular data, manipulate it, fit generalized linear models with R-like syntax, and plot them using readily available packages.One really nice feature (at least so far) of the Julia package ecosystem is that it is almost all on GitHub. A side effect of this is that there is a much greater tendency to collaborate and plan. Functionality tends to be split up into logical chunks, and similar efforts are combined. Split-apply-combine data manipulation. The advent of the Hadleyverse has revolutionized the way many people work with data in R (myself included). Once you’ve gone dplyr, there’s no going back. Julia also has the capability, via the DataFramesMeta package, to do these kinds of manipulations. While still in the experimental phase, you can already split, apply, and combine data frames, and pipe the output from one operation to the input of the next. This brings us to another killer feature of Julia: metaprogramming. Julia is “homoiconic,” a weird word that means Julia code can be represented as a data structure within the language. As a result, you can write programs that automatically generate other programs. See those @ symbols in the @linq and @by functions? That means they aren’t actually functions, but rather “macros”: basically, functions that write custom code based on their inputs. R is also homoiconic, but in my experience only the bravest of hackers ever take advantage of that capability. While still not a beginner’s technique, I find metaprogramming in Julia is significantly easier than in R. Many Julia packages take advantage of metaprogramming, and the results, for the user, can be downright magical. Plotting. There is no default plotting library yet in Julia, but there are several very good options. Gadfly, used here, is a ggplot-inspired library. Also available is PyPlot, a wrapper around Python’s mature Matplotlib library. I wouldn’t recommend everyone drop R and use Julia…yet. The language is less than five years old, and still very much under development. Some features are likely to change. Many packages are still in experimental mode, and not everything that is available in R is there for Julia (though a surprising amount is). Documentation is improving, but is not always complete or thorough. There is not yet an IDE comparable to RStudio. If you’re happy and productive in R (or whatever you’re using), by all means carry on. The Julia Manual. Work your way through the examples here, and you’ll already have a pretty good grasp of how things work. Julia for R programmers (PDF): a presentation introducing Julia to the R-using audience. Differences from other languages: for Matlab, R, Python, and C.
Learning Julia: a large collection of links and videos on the JuliaLang website. This entry was posted in Quantitative, Uncategorized and tagged Julia, programming, Python, R. Bookmark the permalink.